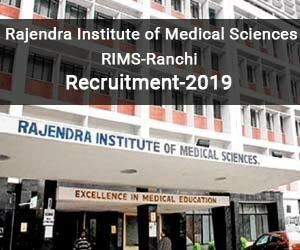 New Delhi: The Rajendra Institute of Medical Sciences, Ranchi (RIMS Ranchi) has released 362 vacancies for the post of Staff Nurse Grade “A”. The selection will be based on Written Exam/Interview. 3. Desirable: Ability to use computers – Hands on experience in office applications, spread sheets and presentations. For General, BC-I, BC-II Rs. 600/-(Rs. Six Hundred only) & for SC & ST candidates Rs. 150/-(Rs. One Hundred Fifty Only), which is non-refundable in any case. 2. The candidate must be a citizen of India. 3. Reservation roster as per Jharkhand Government Rules is applicable. 4. Director, RIMS, Ranchi reserves the right to reject all or any application without assigning any reason. 5. The candidate must enclose Bank Draft in favour of “Director, Rajendra Institute of Medical Sciences, Ranchi Payable at Ranchi.” The amount of bank draft :(i) for General, BC-I, BC-II Rs. 600/-(Rs. Six Hundred only) & for SC & ST candidates Rs. 150/-(Rs. One Hundred Fifty Only), which is non-refundable in any case. 6. Canvassing in any form and /or bringing in any influence will be treated as disqualification. 7. The benefit of reservation shall be given only to the resident of Jharkhand and the certificate to that effect should and must be issued by the competent authority (ies) of Jharkhand state. 8. The candidate shall not be allowed to join the service of RIMS, Ranchi unless he/she is relieved from previous organization. 9. If any information/ document given by candidate in application from is found to be false and forged, candidature will be cancelled or service will be terminated. Director RIMS, Ranchi reserved right to cancel this advertisement at any time as per exigency. 10. All disputes shall lie in jurisdiction of Ranchi. 5. Self-attested photocopies of the mark sheets of all examinations, certificate(s) of educational qualifications, Caste certificate & ail testimonials showing experience etc. and one self-attested passport size photographs should be attached with the application form. 8. Reservation of Post: Reservation of posts wherever applicable, are on the basis of reservation roster for the state level post with resolution No.- 1433 dated 15-02-2019 issued by the Department of Personnel, Administrative. 9. Reforms & Rajbhasa, Government of Jharkhand. 10. The candidates who are employed at RIMS and whose remunerations are paid directly by the RIMS administration will have the benefit of age relaxation for one year for each completed year. 11. In case of All thing being equal, the local resident of Jharkhand will have the reference as contained in resolution No. 9567 dated II-11-2016 of the Department of Personnel, Administrative Reforms & Rajbhasa, Government of Jharkhand.